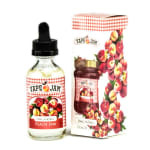 Sorry, Peach Jam E-Liquid by Vape Jam - 60ml has been discontinued. Peach Jam offers a delectably sweet and subtle tart taste of a Georgia peach canned at the peak of ripeness. Vape Jam has packed the full flavor of a juicy peach into a 60ml bottle to give you an amazing all day vape! tastes like fuzzy peach candy! !